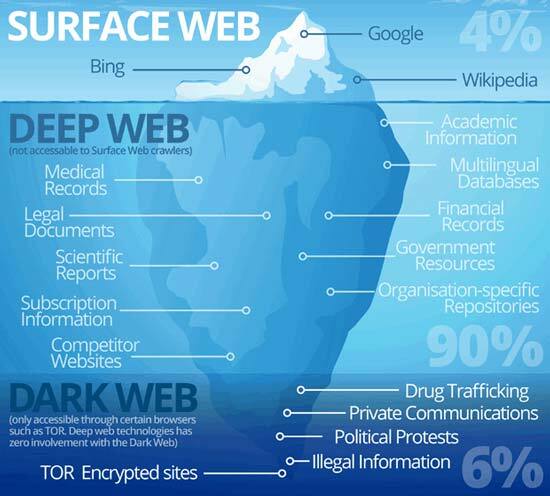 Deep vs Dark Web: Do You Know the Difference? There’s a hidden online world that is much larger than the parts of the web you access everyday — The Deep and the Dark Web. Before we dive in deep, let’s explore what’s referred to as The Surface Web or the Visible Web. Everyday you are searching Google or checking Facebook on the Surface Web. The Surface Web contains websites that are indexed for normal search engines such as Google or Bing. There are at least 4 billion indexed web pages, but a larger world lies beneath. 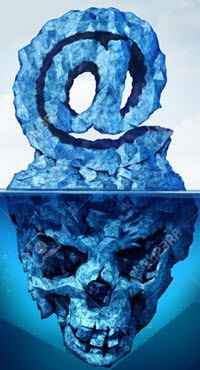 The easiest way to think about the Deep Web is to imagine all the data behind firewalls — databases, business intranets, web archives, password-protected websites, etc. The part of the internet is estimated to be about 400 to 500 times as large as the Surface Web. Within the Deep Web’s search engines, there are search boxes that users can fill out to quickly find what they are searching for. Some will refer to the Deep Web as the Dark Web interchangeably, but they are two different entities. The Dark Web is a set of accessible anonymously hosted websites that can only be accessed with special software that disguises your IP address. The most commonly used software to access this internet is The Onion Browser, known as TOR. The Dark Web is much smaller than the Deep Web, but it makes up for it in variety as there are numerous types of Dark Web sites. It is the most popular marketplace that sell illegal products like drugs or weapons. One of the first successful anonymous marketplaces that thrived on the Dark Web was Silk Road. Founded in 2011, Silk Road was the Amazon of contraband with anonomity — venders would buy and sell goods with the use of bitcoin (an untraceable digital currency). 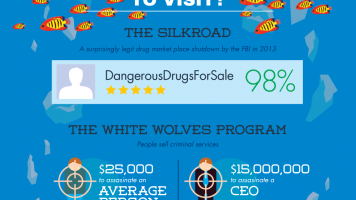 Silk Road was shut down in 2013 with 1,400 vendors and 957,079 users. It had brokered more than 1.2 million transactions, worth $214 million. While rules vary around the world, as a general principle visiting the Deep Web or Dark Web is not illegal. Neither is using deep web technologies such as TOR to anonymize web use. However, anyone using a Darknet Market remains subject to local laws, depending on what you can and can’t buy, sell, ship or possess.